Continuing our coverage of The Potteries, this detailed map covers the SE tip of Hanley, around Joiner's Square, where features include All Saints church, Botteslow Coal Wharf, Upper Botteslow Mill, Lower Botteslow Mill, River Trent. 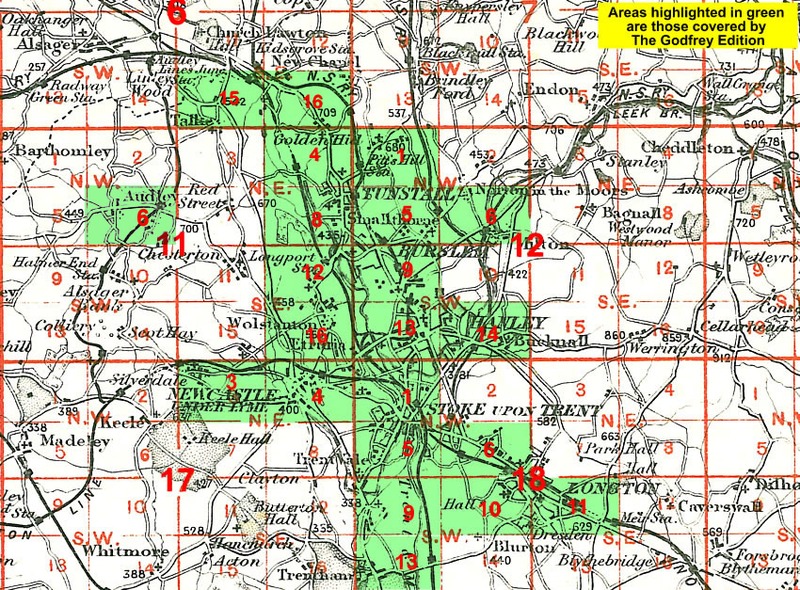 Coverage continues south and east to include Berry Hill Coal & Iron Works, North Staffordshire Railway Biddulph Valley Branch (with part of Fenton Manor station at foot of map), Coal Depot, Berry Hill & Holly Bush Collieries, Berry Hill Brick Works, Northwood Farm, Ubberley Colliery, Lawn Colliery, stretch of Longton Adderley Green & Bucknall Branch, Lawn Farm, Glover's Farm, old coal shafts, etc. The map links up with sheets 12.14 Hanley E to the north, 18.01Stoke & Shelton to the west, 18.06 Fenton to the east. For a full list of maps of Staffordshire, please go to the Staffordshire page or the Potteries page.